. Show SOSA's numbers : Generate SOSA's numbers of the individuals having asked for the number 1.
. 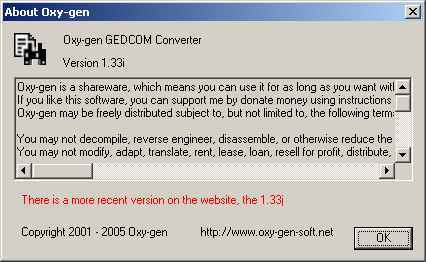 Display SOSA dialog box : Oxy-Gen find automaticaly the SOSA number 1 by seeking the individual that have the more ancestry or by finding the information in the GedCom file (tag "IDNO 1"). With this option Oxy-Gen ask the user (at the beginning of the generation) which individual will be the SOSA number 1.
. Add a prefix to the file names : The name of output file chosen in the main oxy-Gen box will be written at the beging of each file name generated.
. Save options in the registry : The options can be save in the registry and not in the file prefs.ini. In each case, the installation of Oxy-Gen with a more recent release don't delete user defines. Only uninstall will delete them.
. Show the result in end of the generation : At the end of the generation, Oxy-Gen open the default internet browser and display the main page.
. Transform names to uppercase : Convert all patronynes into capital letter.
. 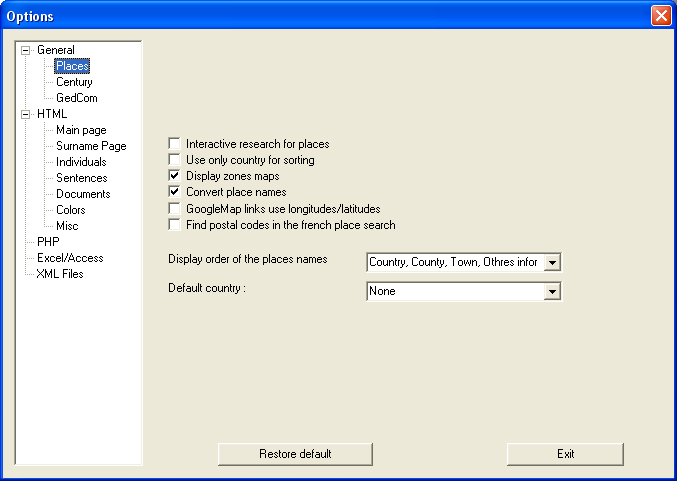 Convert place names : The places names will be converted to the "Oxy-Gen format" in the ouput files (Country/Zone/City/User datas). otherwise the places names will be displayed with the "user format" found in the GedCom file.
. 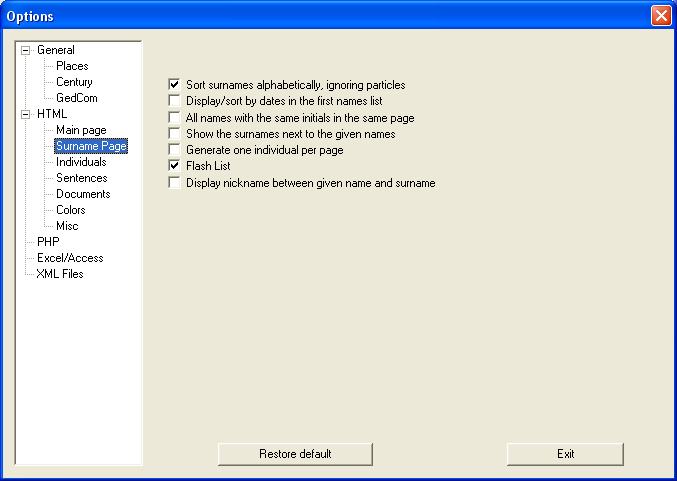 Display prefered patronyms dialog box : Oxy-Gen make a to 10 of the most present name in the "database". With this option, the user can modify this list.
. Check at start if a new version is available : Oxy-Gen can check for a more recent version on the website. 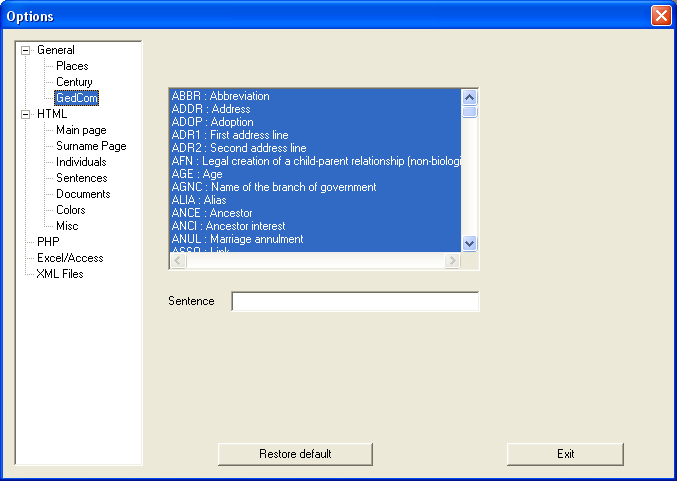 In the case of a new version, a red sentence will be written in the about box/begining box (see picture below). To check the version Oxy-Gen must have access Internet (without Proxy), if you have a virus-checker, it can deny this action to Oxy-Gen.
. Interactive research for places: Display a dialog box if Oxy-Gen doesn't managed to find the city of an event.
. Use only country for sorting : Don't sort zones and cities.
. Default Country : the deduction of places Allows to facilitate if the country is never informed and that these places are all in the same country. (If a different country is specified for a place, this last one is used).
. Cutoff year for the century : Whatever option is chosen bellow (exept 'Display all information'), this date will be used to the limite de date (of the 100 years) for the informations to delete.
. Display all information Don't hide any event or individual.
. 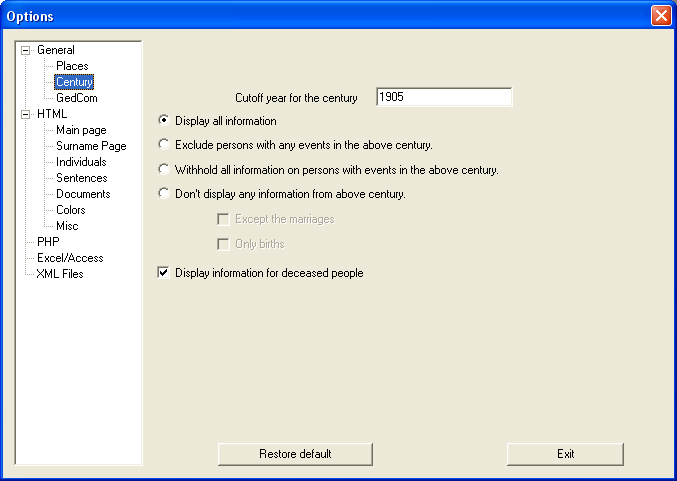 Exclude persons with any events in the above century : Do not display the people having information in the above cutoff date.
. Withhold all information on persons with events in the above century : Display the individuals but no information if one event is above cutoff date.
. Don't display any information from above century : Display all the individuals but not information on the events above cutoff date.
. Exept marriages : Display marriage whatever is their date.
. Only birth : Display birth whatever is their date.
. Display informations of the deceased people : Whatever is the option chosen bellow, display dead individuals and all their events (but not if he has leaving parents (father or mother)).
. The list presents all information which can be contained in a GedCom file. It is possible to decontaminate the posting of one of this information as for example the modification which is not posted by default.
. Light and fast : Set all HTML options to generate less and small files.
. 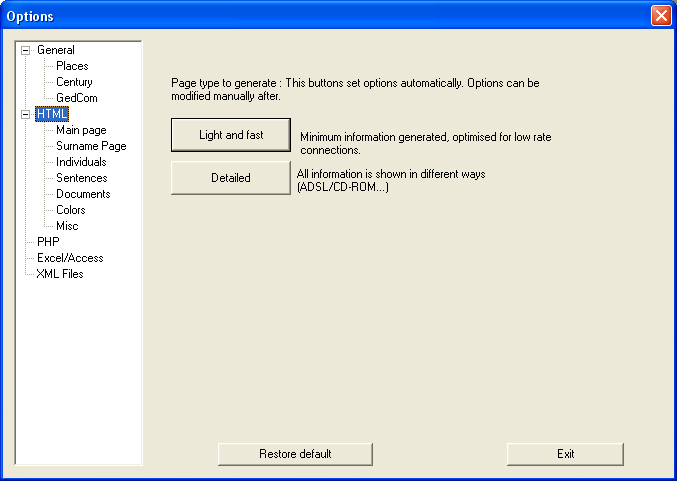 Detailed : Set all HTML options to generate html pages with most detailed informations.
. 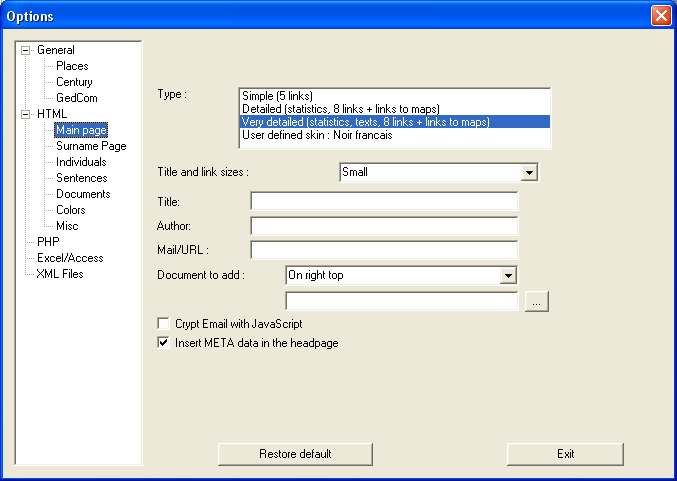 Restore default : Set all HTML options to default.
. Type : Design of the main page.
. Title and link sizes : Allow to modify items in the page.
. Title : Display this title at the top of the page, otherwise display "Généalogy of the famille" and the most popular name in the GedCom file.
. Author : Display this name in the page, otherwise display the author found inside the GedCom file if there is one.
. 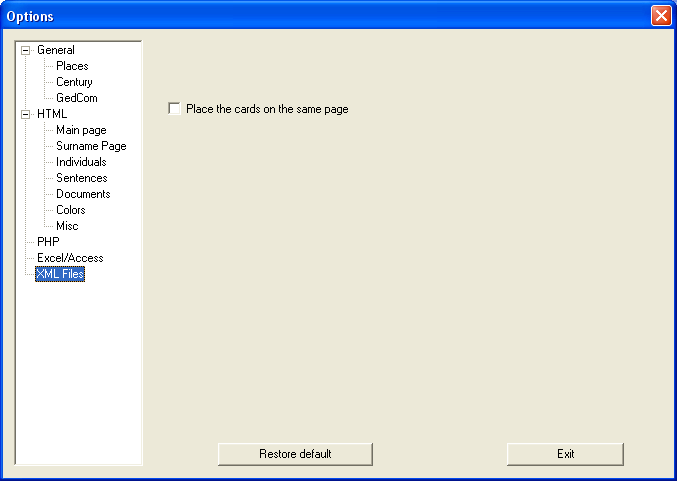 Document to add : Text or HTML file to insert at the to of the page.
. Sort surnames alphabetical, ignoring particles : Account of the particle (' de') for the alphabetical classification does not hold.
. Display/sort by dates in the first-names list : Individuals are sorted chronologicaly, otherwise alphabetical order is used.
. All names of the same initials in the same page : No more than one initial for each page.
. Show the names near the nicknames : Display names near each nick-names (but the name is already at the top of the list).
. Generate one individual per page : Don't group individual on pages (This will generate more small pages).
. Flash list : Name list with the places where they have lived.
. 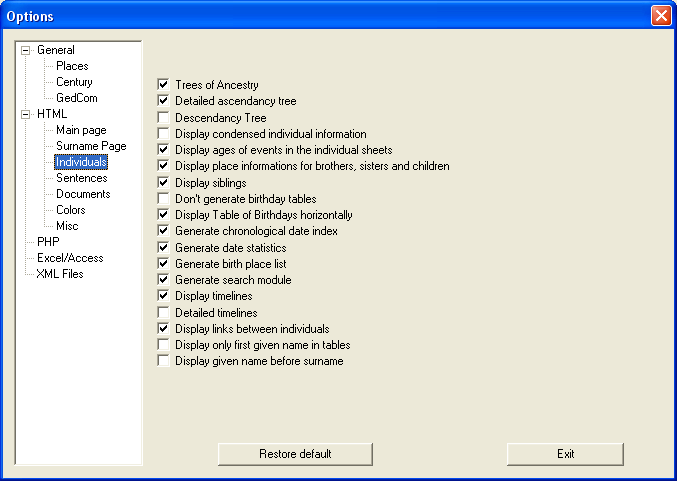 Trees of ancestries : Generate the tables of trees of ancestries.
. Display condensed individual information : Display dates end places on the same line of the event.
. Display ages of the events in the individual sheets : Display the age of the individual near each of his event.
. Don't generate birthday tables : Don't display birthdays tables.
. Display table of birthday horizontaly : Invert birthdays table orientation.
. You can modify or delete sentences that will be displayed in the web pages.
. Remove the accents in the file names : The accents can cause broken links on the web, oxy-gen can remove all of them and generate good links.
. Display pictures in individual description : Display pictures in individual description, or display only a link to see the picture in a separate page.
. Pictures height : Oxy-Gen will resize all picture to fit to the specified height (aspect ratio is kept).
. Display notes and sources : Without this option, none notes nor sources are displayed.
. Show sources out of the individuals descriptions : Display only a link to the source in the individual description and not all the text (all the source text is in a another file).
. Put documents in a sub-folder : Creation of a sub-folder named doc and copy all documents in it (pictures, doc...).
. 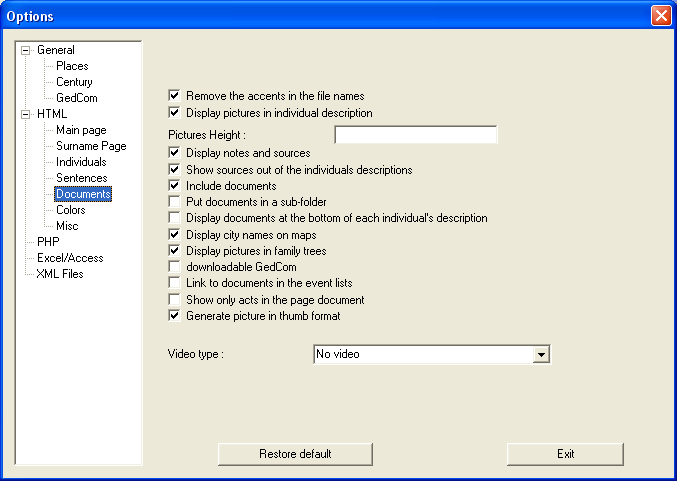 Display documents at the bottom of the individuals descriptions : Don't display documents anywhere in the individual description but move them at the end.
. Here, you can choose colors for the differents item in the generated web pages.
. Include XML generation : Use of the css files. 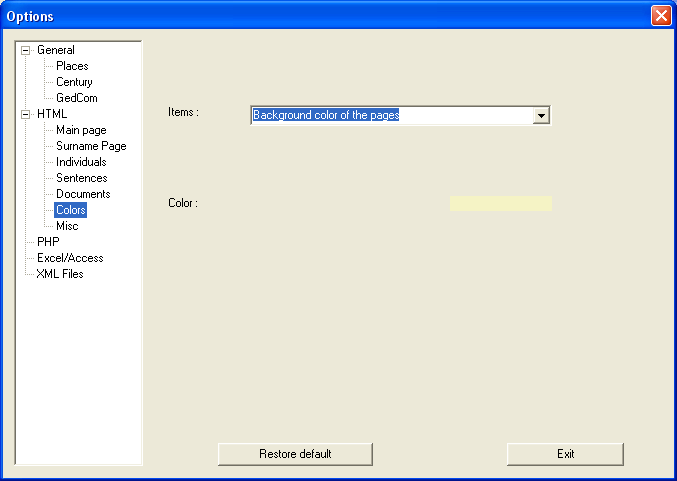 Allow to customize pages more easily.
. Generate frames : Generate page in multiple parts to facilitate browsing.
. Generate full lists (big files) : Display all informations of the same type on the same pages (flash list, events list...).
. Average size of pages : All informations are groupped on the same page keeping if possible the same size for each file.
. Encoding : XML Encoding type.
. Footer : Text or HTML file to include at the bottom of each page.
. Background : Picture to display to the background of each page.
. Display map dynamically : The PHP code in the pages fill the maps (on server disk, there is only one map for each country but take care to the server configuration), if not, Oxy-Gen make all maps (a lot of pictures on the serveur but no matter whith the PHP configuration).
. Place the cards on the same page : Allows to generate one file containing all the people.